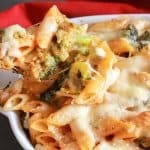 Cheesy Broccoli Pasta Bake is a Delicious Fall or Winter Pasta Casserole, a creamy cheesy Comfort Food Dish that the whole family will love. We are now into the start of one of my favourite Season, Fall and Broccoli! It’s a darn good thing we like it. Tomatoes, Zucchini, Eggplant and Green beans have all finished for the season. I am sorry to see them go but I look forward to all the Autumn vegetables and fruits. So naturally the Italian and his brother have gone crazy with Broccoli and Broccoletti. When I first came to Italy and tasted broccoletti (broccoli rabe), it fast became one of my all-time-favourites. I love it just pan-fried with a little olive oil and garlic or as a fast and absolutely Delicious Pasta Dish. It does have a bite to it and some people need to acquire the taste for it, but once you do, there is no going back! 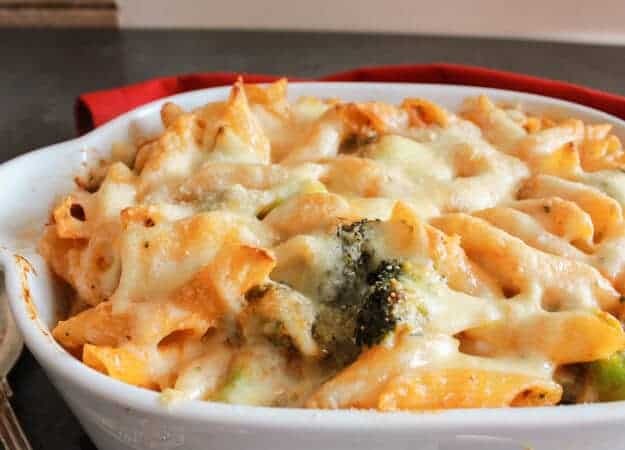 During the cooler months, in my opinion, you can’t get a better comfort dish than a Baked Pasta Dish. 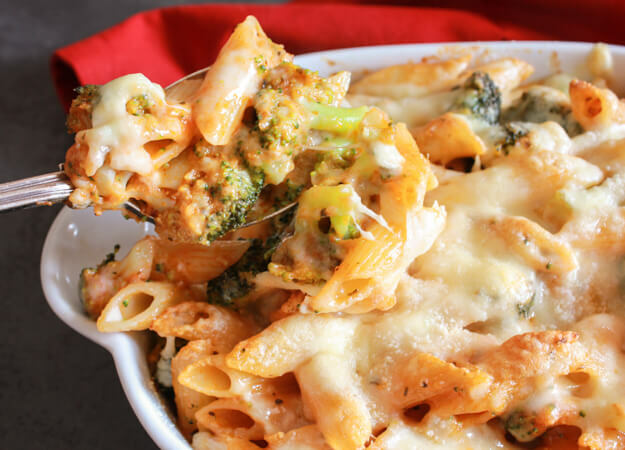 And this Cheesy Broccoli Pasta Dish is perfect! Made with a simple tomato sauce, a mild creamy cheese and of course my favourite, Parmesan. I have also discovered that when you make a baked pasta, a short pasta works best. Especially the rigid pasta, as the Italian says it holds all the saucy cheesy stuff the best! And what better way to sneak in some healthy Broccoli? An Easy and Delicious way to get kids and adults who are not veggie lovers, especially broccoli to eat their greens. Thank goodness I am lucky enough to never have had this problem with my kids. 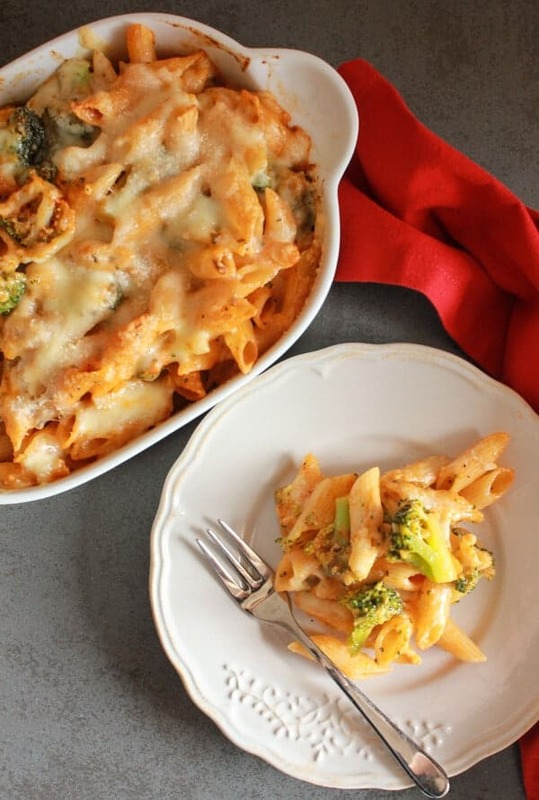 But I think most kids and adults will love this, creamy, Cheesy Broccoli Pasta Bake. And who can say no to Pasta? Buon Appetito! A delicious way to eat Broccoli, a favourite Pasta dish. Pre-heat oven to 350°. Lightly oil an 8 x 6 inch baking dish. In a medium pot heat olive oil and garlic (for approximately 1 minute) then add tomato puree, water, basil, oregano and salt, simmer on medium heat for approximately 10-15 minutes, until thickened. Cook pasta in salted boiling water for approximately 4 minutes then add the broccoli florets and continue to boil for approximately 3-4 minutes, drain well. 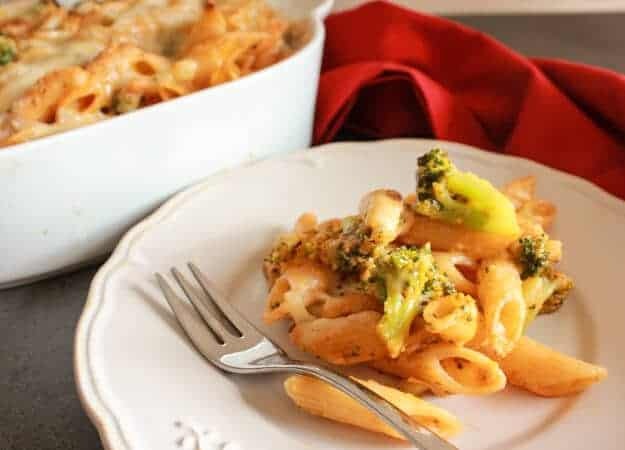 Mix pasta, broccoli florets and sauce, add half the Fontina and 1/2 the Parmesan cheese and toss gently, place in baking dish and top with remaining Fontina and Parmesan cheese. Bake approximately 20 minutes, serve immediately. Enjoy! Hi Anita, thanks for visiting have a wonderful Sunday. 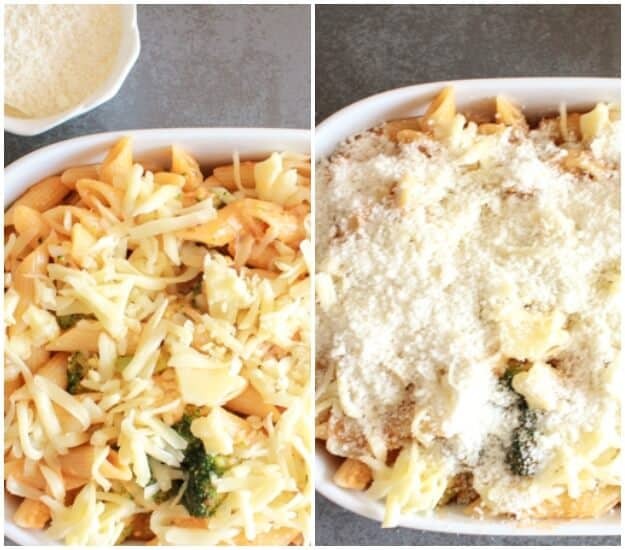 What a time-saving idea – to start the pasta, then add the broccoli. Definitely saves time without any loss of taste. This looks sooo good! Perfect comfort food! I’ve made pasta and broccoli with sauteed oil and garlic. I’ve never made it with sauce. Definitely will make it this way. It’s something different. Thank you. I love broccoli rabe. Had it as a kid in Italy all the time. When I came to this country many years ago, nobody knew what it was…and when people firsr tried it they didn’t like it. definitely an acquired taste. Now it is very popular here in the states….and you can get it all year. This was not the case years ago. I also love it with a short pasta and homemade sausage…..Excuse me must go now and make it!!! HI Clelia, hope you enjoyed your pasta, I know what you mean, I love it one of my favourite vegetables.